Need a residential rental or commercial repair/remodel estimates in Central Texas? Call me. You will like my work and prices. Call me for advice and repair work you need in your home or business. My 30 years experience is what will save you time & money, avoid the fustration the less experience will give you. See recent repair work like I can do for you. Small job expert. Reasonable Fast Guaranteed. Kitchen, bath, cracks, leveling, paint. Anything. Picture #1. I install and refinish all types of floors. My son Nick is a master at turning concrete floors in new and old homes, patios, and drive ways into beautiful works of art. Check it out. You won't believe what he can do to gray concrete - give him a call if that interest you. However, I'm a master at installing and refinishing all other types of floors. Its one of my many skills. This picture shows the worn 50 year old oak hardwood I just refinished for this customer. Nice job - Right? Please Note the "vent grill" in the upper right. I installed a new central-air system at that spot and removed window units as part of the upgrade for them. My having different skills like that will save you hundreds of dollars. Next picture. The old kitchen cabinets and floor was removed and rebuilt to the customers folksy design. They found an old heavy cast-iron sink and windows I plumbed and installed to their delight. The Habitat store at 311 Probandt, San Antonio, TX. was where they found those gems I installed for them to update their home - within their budget. The customer drew a plan for their kitchen redo. Another contractor gave them a bid for $5700 more than my bid. Before this stage of the job, I ripped out the old kitchen and customized it new to plan. They wanted two new windows cut into the wall - you can see the one in the picture. Electrical and plumbing was all done by me, as well as the new cabinets - all made to their plan. Note the "dry-run" on the tile I'm fitting for the new counter-top. They brought the tile. I installed it. Nice! They said one day, "We want this installed." Job changes would be frustrating and costly - but, I very good at helping home owners add new touches - they see are needed as the job progresses. That expertise will help you on your project, too. As a contractor handyman 78666, I advise, guide, and work with my customers in both seen and unseen aspects - Draw blue-prints, estimates for insurance companies, and such, so there's no costly surprises or missed items to surprise you. Note the insurance-covered, home kitchen fire repair I did recently. 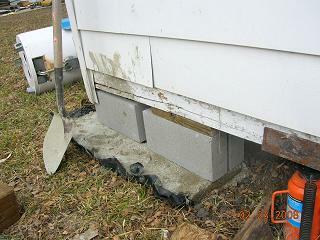 Here is a picture of a house leveling I did recently. This requires lots of experience - which is passed on to you, to do your repair job right, avoid costly screw-ups! More of my handyman 78666 talent ready to go to work for you! Piers may need to go down to bedrock to stabilize the home. if that cost is not an option, remove 2 feet of dirt and pour a pad off concrete 3 foot square and add blocks to the new level position. Cheaper - but may need a shim install on each pier in 5 to 10 years to re level - if needed. The next picture shows how I literally moved and re-plumbed this bathroom for the customer. And, where the toilet use to be, I setup plumbing and electrical for their new washer and dryer. Not shown. Please note the "bowl-sink" and cabinet. The customer found the bowl and cabinet one day. She wanted to know if they could become the new bath sink? I'm plumbing them for her to her great delight. Get the idea of how I can help you? Next picture below. See the door and wall? There was a window there and no wall - I installed the outside door where an old leaky wooden window use to be. And, the see the new wall with new pocket door - I built and installed that for them. This wall now closes-off her new bathroom - above picture - and saved space by eliminating a swinging door. To the left [not pictured], is where the toilet use to be. It is now home for her washer and dryer - which use to be in the kitchen. Why not give me a call so I can put these skills to work on your home or business project. You can call right now! I pull all the permits and inspections for you - if needed. On fire damage, smoke, and busted pipe or flood, I can help you with that also. Call me now. Book mark this handyman 78666, page, too! Beside being a handyman 78666, taking care of small things, I"m one of Central Texas areas truly, energy-efficient, home-building contractors. See this home - my home, designed by me, and built from the ground up, with my 4 helpers. At 210 Durango Street. San Marcos, Texas 78666. My monthly "total" city electric and gas bill average $150 a month year round. 2000 two story with plenty of windows and vaulted ceilings - on pier and beam. What can I do for you? What do you want done? I can do it! I'm here to make your home - better! George Christ 512 665 3388. handyman 78666.